Chaim Bloom interviewed to be the Mets general manager this offseason, ultimately losing the battle to Brodie Van Wagenen. Later, he landed as a finalist in the Giants offseason search for a new operations executive, a similar role to the Phillies and Brewers front office positions he attempted to nab in years past. For good reason, his talents are in high demand. He and General Manager Erik Neander bested projections by 12 wins in 2018, fielding a 90-win club for the first time since 2013. To say they maximized the value of a roster with the league’s lowest payroll through innovation would be an understatement. Sergio Romo pitched on back-to-back days as an “opener” in mid-May, spurring a wave of adoption from other teams with weak fourth and fifth starters. He became one of three relievers in the Rays bullpen along with Chaz Roe and Andrew Kittredge to throw sliders at least 50 percent of the time (min. 30 IP). The Rays were the only team in baseball with three relievers so heavily reliant on sliders, an homage to the breaking ball revolution. More recently, the Rays cut first baseman C.J. Cron after a productive 2018. Others have speculated this occurred because the Rays have an exceptional player development pipeline able to produce comparable value for less than the meager $5 million the Rays would owe Cron. Deep in the same system expected to replace Cron’s value are two talents: Brendan McKay and Tanner Dodson. The Rays recently announced McKay would no longer play the field, limiting him to pitching and DH duties. Dodson, however, remains in a two-way role. In order for the two-way experiment to work with Dodson, the Rays need to understand the optimal workload balance and long-term durability of a two-way player. If they are successful, it will only open up room for more questions at the major league level. But the business of surplus value thrives on understanding complex problems. Bloom & Co. likely relish the opportunity to solve this puzzle. Photo credit: Bryan Green. 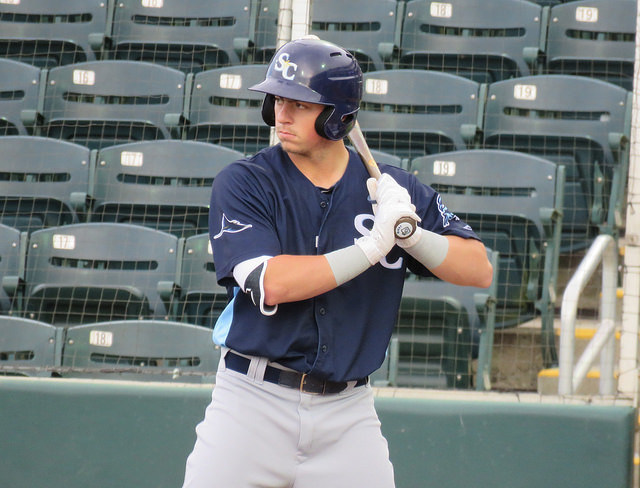 Brendan McKay batting for the Charlotte Stone Crabs. Dodson’s two-way profile is simpler than McKay’s. He projects as a reliever with two above average to plus pitches and the ability to fill a two- to three-inning opener role. At the plate, he is a switch-hitting contact-based outfielder with feel for center field. If you project out his minor league usage to a full season, Dodson can accumulate 40-50 innings on the mound and around 350 plate appearances. In contrast, McKay has been used as a true starting pitcher at the minor league level. He averaged 63 pitches per start in 2018 if you exclude his trio of rehab appearances in mid-July. His workload equates to roughly 25 pitches more than Dodson on average per outing. A key question for two-way player usage is how to balance both roles. Dodson appeared in nine games as a pitcher for the Hudson Valley Renegades. On seven of those occasions he started each of the two games prior to his pitching appearance. On average, the day after his pitching appearances, he started just over two consecutive games. By the end of the year a model emerged for Dodson’s usage: start two games in the field, pitch one game, start three games in succession afterwards, rest one day. McKay started 16 games in 2018, excluding his rehab appearances in rookie ball. In only half of those appearances did he start the game prior. In further contrast to Dodson, he only played in only game on average after a start on the mound. After his first disabled list stint in early June, however, the Rays let him play in two consecutive games after his start four times in a row. Unfortunately, McKay landed on the disabled list on Aug. 30, ending his season limiting the chance to see if the Rays altered or maintained his usage. With their recent announcement, the league is left wondering what the team understood about a player in McKay’s role. Was the in-season fatigue build up from playing the field too much? Was he developing too slowly on the mound? Compare Dodson and McKay to the only other true two-way player sample we have and the Rays usage philosophy stands out. Shohei Ohtani started ten games in 2018. Not once did Ohtani play in the field the day before his start or the day after. He threw roughly 85 pitches per outing, with instances above or near 100 total pitches, but the Angels usage of Ohtani and the Rays usage of Dodson and McKay suggest different beliefs for a similar kind of player. Did the Rays use McKay and Dodson with the intention of keeping their timing at the plate from experiencing a three-game layoff? If so, then why didn’t this affect a player like Ohtani, who routinely took multiple days off and still posted a 149 wRC+ from Opening Day until his June disabled list stint? And how much information can be gleaned from the fatigue data the Rays presumably collected on Dodson and McKay player through the season? Is Dodson’s lower pitch count and higher frequency of positional play preferred over McKay’s longer outings? Is that why they axed McKay’s first-base duties? Or is the key merely how each player is cared for and what they do on off days? Dodson and McKay making it to the major leagues as two-way players is unlikely. In the event it happens, there was a radical idea present to optimize matchups recently killed by the Rays’ announcement. Because Dodson and McKay are right-handed and left-handed pitchers respectively, a universe existed where the Dodson and McKay rotated from a spot in the field to the mound based on the handedness of an opposing hitter (as mentioned by Fangraphs). The advantages of on-field musical chairs would have been numerous, but flexibility is still a potential advantage. Within this flexibility are even more questions. What exactly do the Rays do with the additional room created by having a player fill multiple roles? Nineteen pitchers threw more than 10 innings in relief for the Rays last season. Pushing Dodson to 40-50 innings replaces a player like reliever Jaleen Beeks, who threw an ineffective 44 ⅓ innings in 2018. If Dodson contributes 350 plate appearances on top of his innings, he contributes the value of both Denard Span and Johnny Field, outfielders for the Rays last season (Rays acquired Span in trade, he played only 43 games with the team). The combined production of Beeks, Span and Field equaled around .5 WAR in 2018. Even if Dodson is a replacement-level player at the major league level, his mediocrity would allow the Rays to utilize spots on their roster for more relievers or other utility position players. McKay’s potential playing time looks more like the combined reps of Yonny Chirinos and Ji-Man Choi. That duo held down bigger roles for the Rays, hurling just under 90 innings and 160 plate appearances respectively, the latter McKay should easily overcome. With around 1,500 innings needed by a club’s pitchers in a given season, Dodson and McKay wouldn’t create new roster spots for the Rays, but rather fill in pieces of their season-long puzzle. This would provide the Rays with a chance to distribute smaller pieces of playing time to other players impacted by the flexibility of McKay and Dodson. Matters the Rays cannot control could impact this saga too. Injuries for either player at the major league level mean the Rays would need to replace two roles rather than one. This makes workload management such a vitally important part of this experiment. Major League Baseball and the MLBPA recently proposed rule changes that could affect two-way players as well. A 26-man roster with a 12 pitcher maximum could feasibly make a two-way player even more valuable. If the Rays could designate Dodson as a position player and still have either pitch, they would have a one-pitcher advantage over other teams. The Rays will likely enter 2019 possessing the lowest payroll in baseball for the second consecutive year. Dodson should see time at High-A before the coming season ends while McKay will likely play the majority of his season in Double-A no longer playing first base. Higher levels of skepticism for something so unique will follow both through the minor leagues. The most valuable gain will be adding to the rolling dataset on each two-way player. If this experiment works, the Rays will have the most unique advantage in all of baseball. Special thanks to Eric Longenhagen for helping me with this story. His prospect work for Fangraphs can be found here. Newer PostMailbag Monday: Questions For Days!